4 Reason’s Why An App Could Benefit Your School! More schools are choosing to ditch the paper and use a school app for their parental engagement and more. There is so much technology around and seemingly more is finding its way into the classroom, mobile devices being one of them. Considering nowadays 4/5 adults own a smartphone in the UK, there’s no surprise more schools are going paperless! With statistics suggesting that on average schools use up to 1 million sheets of paper a year, and £60,000 per year on printing and photocopying, ditching the paper could be the way forward. This can be a tricky one to get right but an app is a great way to improve teacher to parent communication. Remember 4/5 adults now own a smartphone, that’s a huge number of parents you could be contacting! Parent interaction on blogs, forums etc. How many times have you had a parent not respond to a letter or say they have never received it? With paper it’s so easy to end up lost in the bottom of a bag, which means it’s difficult to track if parents ever receive information. 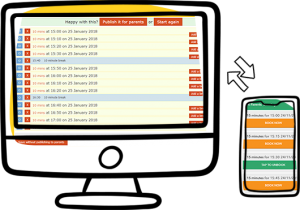 With apps and email monitoring you can track forms, parents evening bookings, emails and more! Think about all the newsletters, permission slips, letters that you print to send out to parents… By sending communication out via an app you can massively decrease the amount your school is spending per year on printing and paper. Text messaging is costing some schools upwards of £4000 per year, sometimes even more for larger schools. With the rise in smartphones, using an app to send out your messages can massively decrease or even eliminate this cost for your school. Using an app can massively decrease the workload on teachers and office staff in the school. Going paperless is a huge relief on administration and gives you one easy place to upload all your letters, forms and other parent communications. Removing the hours of printing, photocopying, posting and inputting responses to other publications can all be cut down by using an all in one app solution. At School Spider we offer some great technological tools to help your school! Our website package includes a super easy to use interface to manage your website, alongside parent communication tools and a free parent app! If you would like to find out more about School Spider or request a demonstration of what we do, get in touch on the information below.